Some of you may remember reading about the dreadful fish massacre that took place a few years ago while my husband and I were in transition, moving from the suburbs to our farm. Our house was pretty much vacant, but when I stopped by to pick up another load of “stuff,” I went to check on our beautiful koi pond. What I found was a bloody scene of terror, with dead, brutally beaten koi strewn about our patio and yard. Despite the generous reward PETA offered for information leading to an arrest, the neighborhood punks who perpetrated this senseless violence eluded the law. We mourned the loss of our cherished friends and began the gruesome cleanup. As we sorted through the devastation and destruction in our pond, we discovered one injured baby and a few fry hiding in the rocks. We immediately set up a “temporary” tank in our new garage and brought them to the farm. 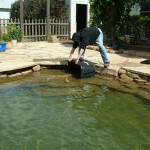 Our plan was to build a bigger, better koi pond in our back yard as soon as possible. As soon as possible turned out to be seven years, but we were finally able to accomplish that goal. Unfortunately, the new pond was too late for most of the survivors of that shockingly horrible atrocity. 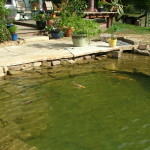 When we were down to one 20-inch orange koi earlier this year, my husband suggested finding him a new home. Instead, true to my motto “Where we go one, we go all,” this spring we headed to a pond store to purchase a few friends for Fishie. The spectacular display ponds on the premises inspired us. My husband, who was struggling through chemotherapy, lit up. I hadn’t seen him that happy in months. He chatted with other customers and employees. We lingered, looking at waterscapes and fish. We were, to use a hilariously appropriate metaphor, hooked. Chris tried to be sensible: we need to spend the money on medical bills. I concluded that the pond would be better medicine than many of his prescriptions, so I scheduled an appointment for an estimate. After three estimates, we chose a pond builder. We had to wait all summer, but the pond was installed at last. Even before it was finished, I began looking for more fish. Fishie and the two fry we purchased that auspicious day would hardly fill this 11,000-gallon pond. 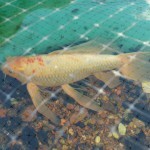 I saw a post on a local koi and pond page on Facebook: someone wanted to find a new home for two large koi because he was moving and needed to tear down his pond. I contacted him, but when he explained that he was selling, not re-homing, them and that each was priced around $100, I politely declined. My budget was busted on the pond. I thought that was the end of that transaction, so I kept looking. But I heard back from this man a week later. He had sold one and wanted me to make an offer on the other, his last fish. 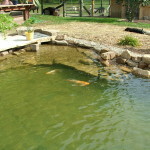 Because our pond, which was supposed to have been completed by then, still wasn’t finished, I declined to make an offer. 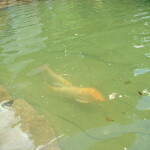 But he and I started talking “koi.” I shared photos and details of our pond. A week later, this kind man offered me his fish for free. 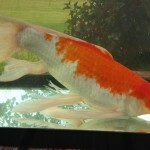 It turns out that Chou, a beautiful orange and white 12-inch Hariwake koi, was so lonely and depressed, he was in danger. He wasn’t eating. He wasn’t swimming around. He had lost almost all his color. Fortunately, this man put his fish’s well-being ahead of his bank account. He liked the looks of our pond and thought it would be a good home for Chou. Over the years, I have rescued dogs, cats and even chickens. This would be my first fish rescue. As soon as the pond was finished, filled and ready for fish, we drove up to get Chou. We also picked up some colorful fry: the more the merrier, right? 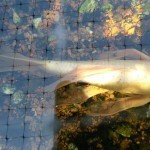 We took steps to acclimate them and finally released everyone into the new pond on a warm, sunny afternoon. It was a blissful moment: the culmination of a long-planned dream. For the first few days we noticed that Chou stayed close to Fishie, maintaining physical contact nearly every minute of the day. It was difficult to see where one fish ended and the other began. After a few days, as all the fish settled in and became familiar with their new surroundings, Chou established a bit of independence, but was usually found near either Fishie or the group of fry. Chou liked to be with his new friends. We noticed something else, too. His color was returning. He was eating. He was swimming in patterns that I can only guess were joyous. Not many people take time to think about the mental well-being of fish. Few consider the emotional health of their pets, and fewer still contemplate the happiness of wild or farmed animals. When we told visitors this tale, they were stunned that a fish could feel loneliness, that a fish might have emotions and yearn to be with others of his own kind. I knew. It’s why I’ve been vegetarian for more than 30 years – and yes, that includes fish. (Why do people think vegetarians eat fish, anyway?) It’s why I’ve been against fishing since I was a little girl, watching in disgust as my uncle cleaned his catch. Fishing isn’t a sport and is not allowed on our farm pond. People ask. If they find out I’m vegetarian, they explain that it’s “only” catch and release – fear and torture, but not death. The answer has always been and will always be no. No fishing allowed. I believe humans should be caretakers, not killers. We strive to give all the animals on our farm a safe environment where they can live a happy, healthy life with others of their kind. We know every animal experiences fear, sorrow, grief and loneliness. But they also feel joy, happiness, love and pleasure. That’s why we are so elated to have been able to rescue Chou and offer him what we believe will be a happy home for him – a large pond with waterfalls to play in with plenty of friends. He won’t be lonely ever again.